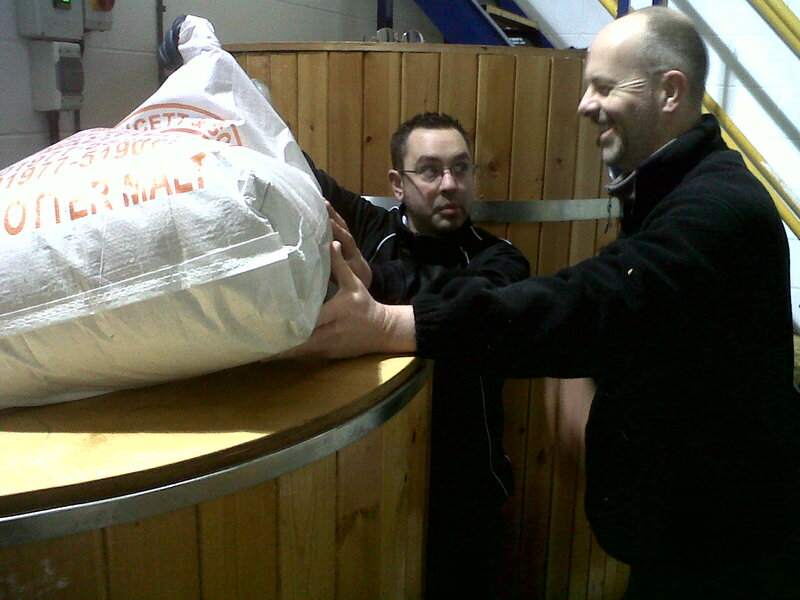 Mark from Revolutions Brewing writes: "Today (March 27), we are brewing the winning entry in our 2013 competition. It is a 4.5% stout called Uprising designed by Pete Hindle @pchindle – he describes it as “a stout for people who don't like stout”. We can't believe that such people exist, but it's good to think we may have a beer that may convert them! "Congratulations and honourable mentions to Stuart Goddard, Steve Syson and Zak Avery, whose beers ran the winner close. "At the time of writing the Maris Otter, Roasted Barley, Black Malt and Dark Crystal is mashing away – the hopping regime later will consist of Goldings, Challenger and, the special ingredient, Nelson Sauvin! "We must thank our esteemed judges who selected Pete's beer as the winner from the 11 beers submitted for the competition. They are all people that we have collaborated with in some way over the past few months – please check out the plugs for their assorted projects. "1 – Paul Marshall (Lone Wolf) - @iamlonewolf – Leeds based musician whose new album The Lovers is fantastic - well-worth checking out – as was the 6.9% IPA we made with him – (there is one cask left, it will be available at North Bar for Record Store Day – April 20th). Lone Wolf will be performing at Jumbo Records on the same day. "2 – Leigh Linley - @leighgoodstuff – Beer and food blogger Leigh has an exciting new book “Great Yorkshire Beer” about to be published http://goodfoodgoodbeer.wordpress.com/great-yorkshire-beer/ - we're in it! We also collaborated with Leigh on our new 3.9% beer E.P. Session Pale, which has been going down well with drinkers throughout Yorkshire and further afield. "4 – Sam Airey - @SamAirey – Welsh via Leeds singer songwriter / promoter and record label chap. Also knows a lot about tequila. "5 – Anthony Kitching (Kitch) - @framkitch @friendsofham – Kindly provided table space for us all to sit around and pontificate in his busy, successful and quite splendid bar. He really liked the winning beer, so we assume it's a given it will be on the bar in a few weeks! "6 – Tyler Kiley - @Tkiley1 – Quiet, unassuming American gentleman, who dispenses advice and beers from behind the bar at Friends of Ham with unique panache. We discovered that he has a dislike for beers that taste of dirt. "7 & 8 – Mark Seaman & Andrew Helm- @revolutionsbrew – Thanks to all the entrants for submitting your beers, the overall quality was tremendous and we're sorry that we can't brew with you all. "We will advise you all where and when the winning beer Uprising will be available!" Many thank from the Leeds Homebrew Group to Revolutions for this opportunity, and congratulations (again) to Pete - two years on the trot! A belated congratulations Pete! ...AGAIN! Also well done to the other beers that ran the competition close. A big thanks to the judges and of course to Revolutions Brewing Co. - cheers chaps.